The second night of the Superstar Shakeup kicked off on SmackDown Live with the arrival of Kevin Owens and the KO Show. Owens spoke to the Montreal fans in French and then introduced his guest for the night, WWE Champion Kofi Kingston. Kofi and Woods came in and they discussed his title win and then the fact that Big E was injured last week. 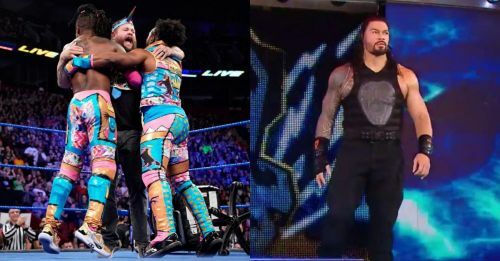 KO offered to be the third member of the New Day and Kofi & Woods needed to see his dance moves before they approved of the new honorary member, Kevin Owens. 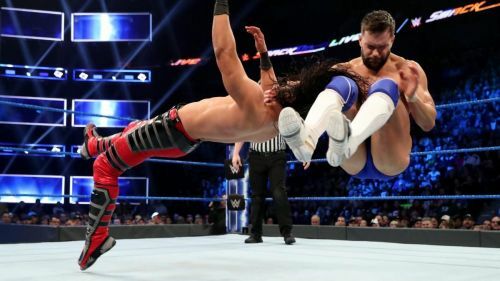 The Intercontinental champion showed up on SmackDown Live followed by his challenger, Ali. Ali hit Finn Balor with a Facebuster and struck him across his chest with a couple of chops. Balor hit a big chop and a Reverse DDT. Finn Balor took down Ali and then tried for the Coup de Grace but Ali stopped him on the top rope. Ali threw Balor down with a Hurricanrana from the top rope. Balor took out Ali with a dropkick after a reversal and then hit the Coupe de Grace. Backstage, it was time for Kevin Owens' initiation into the New Day. Kevin Owens has to eat a plate of pancakes in 5 minutes and 37 seconds and he does, albeit with the help of movie magic. Charlotte tried to start with the Big Boot but was taken down by Carmella for a near-fall. On the outside, Charlotte drove Carmella into the barricade. Carmella recovered and dove on Charlotte. She brought Charlotte into the ring for a near-fall. Carmella hit Charlotte Flair with a Bronco Buster in the Corner but Charlotte sent Carmella out of the ring with a huge Big Boot. Charlotte dropped Carmella to the outside again with a Dragon Screw. Charlotte threw Carmella into the barricade again. Charlotte was trying a move from the barricade, but Carmella dropped her face-first. Carmella continued by putting her in the ring. Charlotte hit A Figure Eight Leglock and that was it for Carmella as she tapped out.